P.S. Thanks for all the postcards. This one from our Canadian friend Sherrie is amazing! 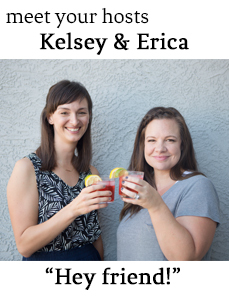 In current obsessions, Erica can't stop drinking Diet Cranberry Splash Sierra Mist, and Kelsey is guzzling Trader Joe's Chai. In neighborhood news, Kelsey's census dreams came true, and the census representative may have gotten more than she bargained for, and Erica will NEVER go to library story time again. Thanks so much for listening. Happy Thanksgiving! If you are doing any Black Friday Amazon shopping, don't forget to grab our link and help out the show.